Santorini is a place I've always dreamt of going but never thought I actually would until I was much older. I'm obsessed with amazing views and sunsets so I just always felt like it was the perfect destination. As you can imagine I did not stop taking photos and videos so I may do a separate blog post to share all of those with you. For 2 out of the 7 nights we were so lucky to have the chance to stay at West East Suites in Imerovigli, which is close to Fira, the capital of the island. So many of you asked about the hotel and which room we we're staying in so here is all the info.. If you've been to Santorini before then you'll know that most hotels are very small and are more like villas and suites. 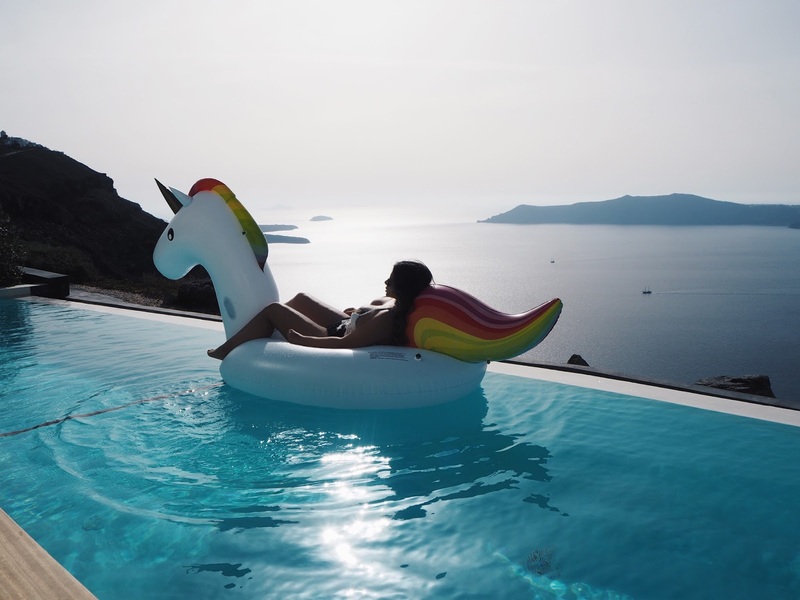 West East is divided into 2 sections (West and East) and both sides overlook all the magical views of Santorini like the volcano, caldera and Aegean. We stayed in the Superior Pool Suite, which was unlike any room I've ever stayed in before. The sun loungers that hung over the pool were just as comfortable as a regular bed. 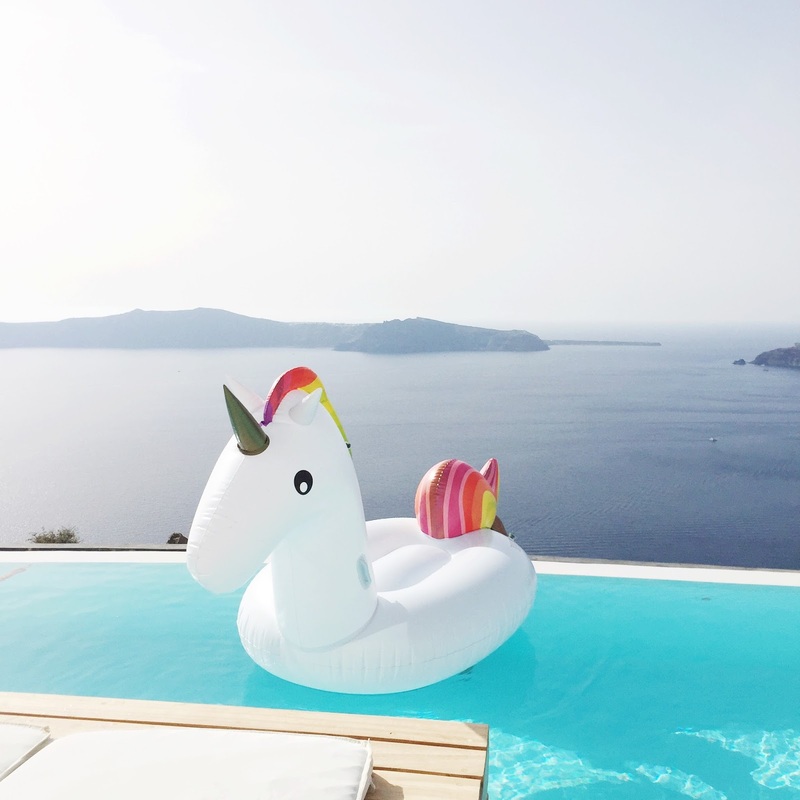 I loved the privacy of having our own pool - of course I brought a unicorn inflatable to enjoy it to the fullest! We also had the view of the sunset over the caldera which was amazing to just sit and watch. We were given a breakfast list that we could fill in and order to be brought into our room to eat either by the pool or in bed. There was so much to choose from so we ordered a variety and it would always keep us full till lunch time. They also have a massage service with loads of different options which can be done in your room. We went for the Indian massage which was a neck, back and shoulders massage for 30 minutes and it cost 60 euros. There really was no need for us to ever leave the room, we had everything we needed! I can't even begin to express how lovely and friendly all the staff were, they did everything to make our stay as special as possible. When the time came to check out we did not want to leave! If any of you are thinking to visit Santorini I would 100% recommend staying at West East Suites, especially during off peak times as it's so quiet and peaceful (and of course cheaper ;)).